Two members of the Department of Medicine received UW School of Medicine and Public Health (SMPH) Diversity Awards, which were presented at the 2019 SMPH Diversity Summit on January 24, 2019. Fabu Carter, MA, outreach specialist, Geriatrics and Gerontology and Alzheimer's Disease Research Center (ADRC), received the 2019 SMPH Diversity Award for a staff member. Carter is pictured above (center), flanked by Dean Robert Golden, MD (left) and Associate Dean Brian Gittans, EdD (right). Carter is responsible for the recruitment of African-Americans into the ADRC Clinical Core. In addition, she serves as a volunteer advocate in the SMPH Diversity and Inclusion Advocate Program and is assigned to teams from four departments to address concerns and promote diversity throughout the school. Her nomination states, "Carter came to the ADRC with many skills. She is professionally known as a poet, columnist, storyteller, educator and outreach specialist/community advocate who works and writes to encourage, inspire and remind." 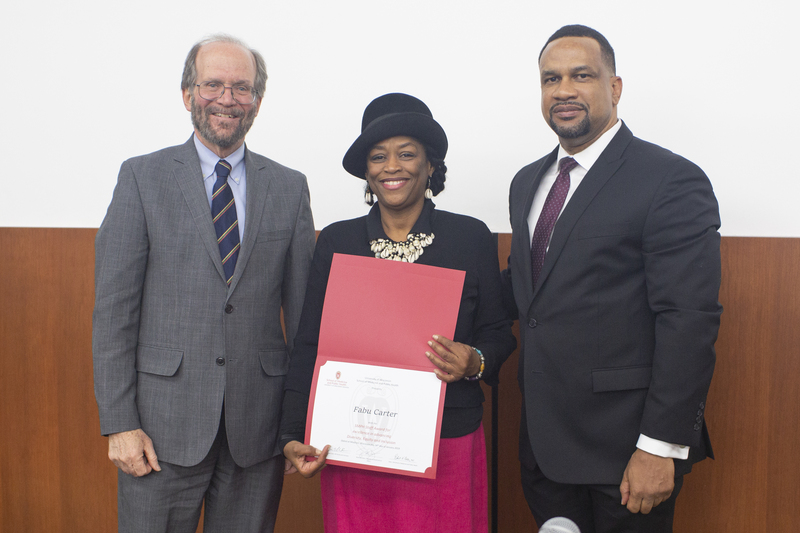 In 2016, Carter was honored as a UW-Madison Outstanding Woman of Color. A scholar of African-American literature, she has published four books of poetry and won an Outstanding Achievement in Poetry award from the Wisconsin Library Association. For the last five years, she has volunteered in local nursing homes leading the Alzheimer's Poetry Project. Recently, she was recognized by the organizers of Black Women's Wellness with a Legacy Award for her advocacy in promoting health in the Black community. Bret Benally Thompson, MD (pictured at right, with Dr. Golden and Dr. Gittans), clinical assistant professor, Hematology, Medical Oncology and Palliative Care, received the 2019 SMPH Diversity Award for a faculty member. Dr. Benally Thompson serves as medical director at UnityPoint Health-Meriter Hospital. He is actively involved in several organizations dedicated to the improvement and advancement of Native American students and communities in health. Within SMPH, Dr. Benally Thompson has been a strong advocate, supporter and contributor to the establishment and growth of the Native American Center for Health Professions (NACHP), which focuses on the recruitment, retention and graduation of Native American Students into the health professions. He is a member of NACHP's advisory council and serves as cultural advisor, helping to lead and facilitate several culturally-responsive programs and gatherings for NACHP. Dr. Benally Thompson is also actively involved in several national organizations including the American Indian Science and Engineering Society (AISES), in which he serves as a member of the Elders Council, and the American Indian Cancer Foundation, where he serves as chair of the board. In the latter leadership capacity, Dr. Benally Thompson positively impacts efforts nationally to address the tremendous cancer inequities faced by American Indian and Alaskan Native communities, including planning for the organization's annual Pow Wow for Hope and Indigenous Pink Day. Additional honorees included third-year medical student Nnenna Ezeh, who received the 2019 SMPH Diversity Student Award, and the Native American Center for Health Professions (NACHP), which received the 2019 SMPH Diversity Organizational Award.